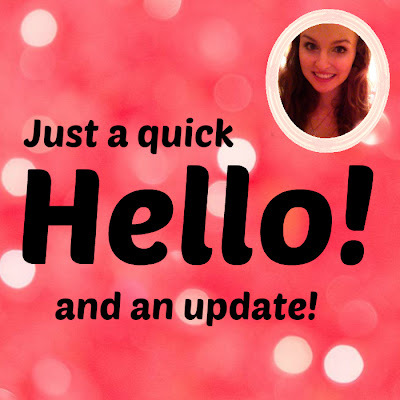 Southern In Law: A Quick Hello and an Update! A Quick Hello and an Update! Why hello, lovelies! Just popping in to say a quick hello! This week is quite hectic - and how is it Wednesday already?! Jesse is away from work so I'm playing the single lady role - though I haven't had much time to even think about that! If I haven't been working, I've been designing or organising things for the wedding - and just to add a little extra to the mix, I took a trip to the doctor's today as well. Don't worry! I'm all fine - I just needed to check what's going on with my persistant cough/sore throat and find out about needles for Bali. Eeeeek, even typing the word needles gives me the heebie jeebies. I'm actually terrified of needles - and my doctor has always dreaded giving them to me (as she says I'm worse than babies) so I've managed to convince her to give them to me in my thighs. I'm not sure if that was a good idea - or a potentially stupid idea, but we'll soon find out. Before you think I'm crazy, the nerve damage and problems with my arm have always meant my arm was incredibly sensitive. For whatever reason, my brain decided both arms are completely sensitive so someone touching my bare arm will give me the heebie jeebies - let alone getting a needle in either arm. Oddly enough, I'm perfectly fine with blood tests - it's just putting something in that's the problem. But tell me, are you needle phobic? Or do you have another phobia that people mightn't know? The doctor knows I'm so terrified of needles she told me I had to bring my Mum when I get them done - not just Jesse haha. Aww! So many people are afraid of needles and would totally identify with you. They actually have never really bothered me as long as I don't look. HOWEVER, holding your baby while he gets jabbed and listening to his cries is a completely different ball game. It's actually gut wrenching and I was fighting back tears!!! I can't even imagine holding your baby while they get a needle - even my Mum will pull faces and look horrified when we get needles. Luckily we don't usually see her face, but when my sister was getting a needle in the hospital I saw her cringeing with tears in her eyes as they jabbed her. Eek! Ew needles are the worst!! I have my partner with me always when I get them. When I was in hospital they gave them to me in my thigh rather then my arm and it is 100000x better and less painful! You shouldnt need too many vaccinations, maybe hep A and typhoid which can be given in a combined vaccine which means one less needle jab! Good luck with it hunny, I went to Bali last year and loved it. Ubud is amazing!! Oh thank goodness! I'm so glad you said that!! I didn't have a lot of vaccinations as a child because I was so scared of needles so I need Hep A/B, Typhoid, the Flu Shot, Tetanus and she also wants to make sure I am protected against malaria and japanese encephalitis - just because my body is so sensitive they don't want to take any chances with anything.